Why do people like camping in remote forests? Sure, the scenery can be beautiful and peaceful, but you are potentially isolated with dangerous wildlife, harsh weather, and/or psychopaths that want to kill random people for unknown reasons. Many movies in a few genres have suggested this, and Desolation is one of the latest. Desolation is kind of a cross between a family drama and horror thriller, gelling more with the former than the latter. With only three characters, not counting the creepy killer, there is far more time spent on character development than would typically be seen in a horror film. This wouldn’t be bad if 1) I wasn’t expecting a horror film, or 2) the character development was more interesting. Aside from some creepy stares from a stranger across a lake, there really isn’t much suspense or creepiness early on. And even when the action picks up, it still doesn’t do much to raise hairs or create goosebumps. The plot, unlike myself, is fairly thin. A widowed mother takes her son and her best friend into the woods to mourn the loss of her husband and scatter his ashes. The adults reminisce over cigarettes (or whatever it is they are smoking) or the family reminisces about their lost family member or current status with the kid wanting to be treated differently. The trio soon find themselves running, hiding, and fighting for their lives when a solitary hiker sets his murderous sights on them for whatever reason that wasn’t really clear to me, if one was revealed at all. I applaud the effort. There is not an over-reliance on cheap “jump scares” and they focus more on the characters than the terror. But, at the same time, there is also very little scares in general. I found myself losing interest long before any action, then the action wasn’t enough to really draw me back in. The killer, while creepy at times, isn’t all that threatening, except that he’s preying on two women and a child; all of whom are arguably in a weekend state and he still has to pick them off one by one. 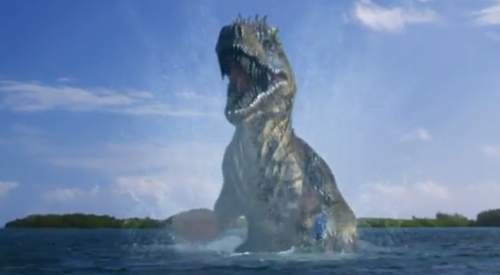 DVD Review: ‘Poseidon Rex’ Is A Really Fun Bad Movie!